Brad Hollibaugh enjoys intimidating John, who accidently interrupts Brad's posing session in his TROPHY ROOM. Brad Hollibaugh enjoys intimidating John, who accidently interrupts Brad's posing session in his TROPHY ROOM. He shows John his 60 inch chest, 27+ inch arms, 34 inch quads, and 23 inch calves, demonstrating what a "REAL MAN" looks like. John cowers as Brad shows off every inch of his massive body. 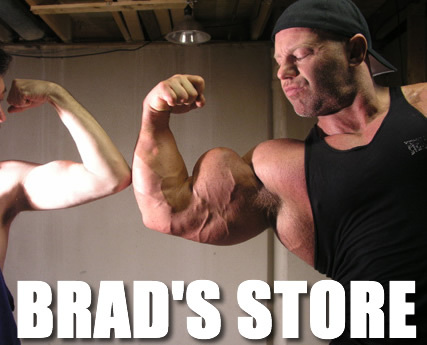 BONUS: Muscle Dreams -- Brad shows how the weights in most gyms are mere toys to him.